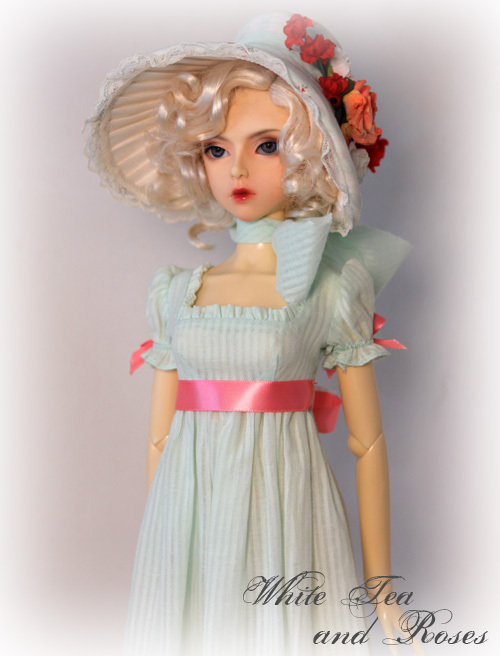 So I finally am able to post the pics now, and give you a little insight to my thought process on this Romance Challenge from the Couture Doll Shops. The entries were published in the latest FDQ magazine-Romance edition- as well as a link from Couture Doll Shops to a voting page. Tomorrow we will find out who won the challenge by popular vote. So wish me luck!! 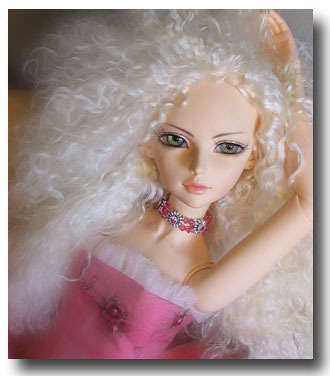 When we were given the instructions for this latest challenge, I knew I wanted to use my BJD’s rather than the 16″ fashion dolls. I needed to represent my Angel Rose shop (located in Couture Court in the Couture Doll Shops). 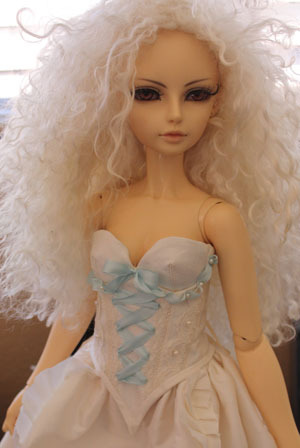 I have done so many challenges using the fashion dolls that my BJD’s were getting neglected. 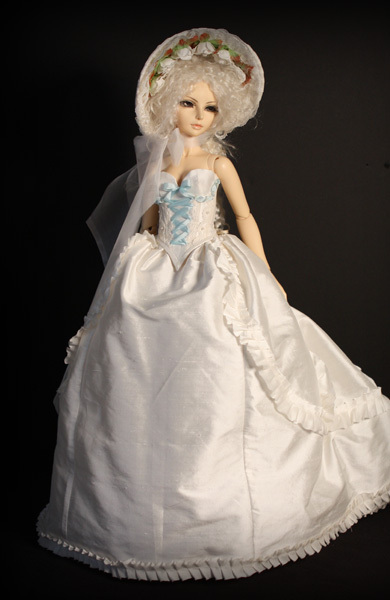 I also knew I wanted to do something with historical inspiration, because I think the historical dress is so romantic. First was going through my books on historical detail and fashion, and finding my fabric. I had quite a bit of off white silk dupioni that I really needed to start using and white/ivory is very romantic and bridal. But I didn’t want to do a bridal look per-say. Also, white and ivory seemed very in-fashion at the moment. I also knew I wanted to do a corset and a full skirt. 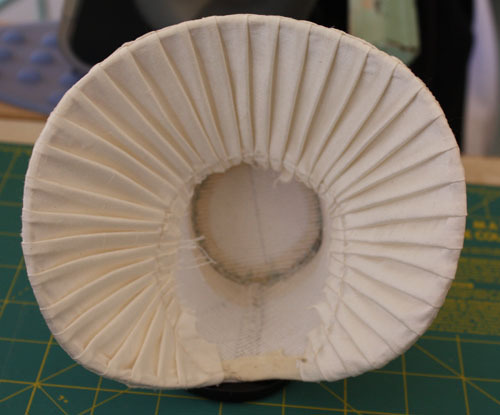 To top it off, a bonnet made of buckram and millinery wire, covered in the matching silk with a pleated under lining and flowers. (I didn’t get a chance to take many pictures while completing this ensemble-hubby was using my camera quite a bit for his stuff) I was actually sewing this hat during one of my daughters volleyball games hoping to get it finished in time. I’m always completing at the last minute. I did get it completed on time and the pics taken in time for the magazine. A tortured romantic soul-she wanders aimlessly, not knowing when the eras or time begins or ends, as her fashion shows in a mixture of historical styles. A ghostlike figure forever searching for the one true love she lost…. She pauses…Does she see her one lost love? At least it was finished for now. I needed to move on to another challenge that was presented to us on Couture Doll Shops for another magazine and it was a a big challenge. So of course that will be a post in the fall. 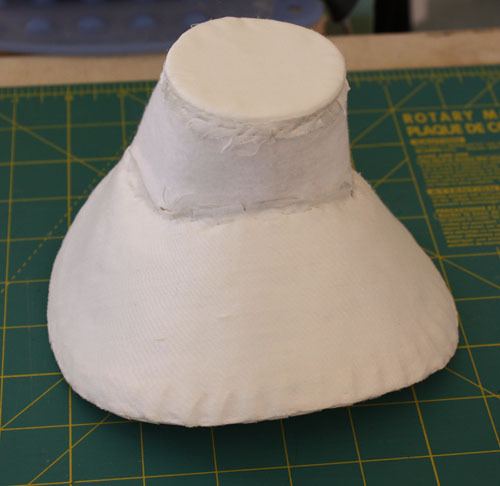 Wish I could give some sneek peeks because I think it turned out great and there’s a bonus tutorial coming with it but you all will just have to wait….. When that challenge was finished I was able to move on to finish the last component of this one- a jacket. Taking inspiration from the Regency era, a ruffled front, pouf sleeve jacket emerged to be worn over the corset. Also, new pictures needed to be taken since the other ones were done in haste. A little while back we were given a challenge on CDS- Romance was the theme. I couldn’t share back then because it was going into a magazine and of course the mags don’t want anyone to know ahead of time. I will be blogging on it in a little more detail within the next couple weeks but for now I wanted to share one of the romance related collections I will have available on my site. Please note that these are not the outfits that are in the mag- still can’t post those yet. Now this is a little collection I had started over a year ago and never finished (gee I have a few of those things around). I was going to do a third gown- but ran out of fabric so I guess the two will suffice. Hmmm is that is why I never really finished it-trying to figure out what I was going to do for that third gown? Anyway, when the Romance theme popped up I figured this would be a good ensemble to finally complete and put on my website for the theme. I really like how they turned out- very romantic, don’t you think? Another 18th c inspired gown. 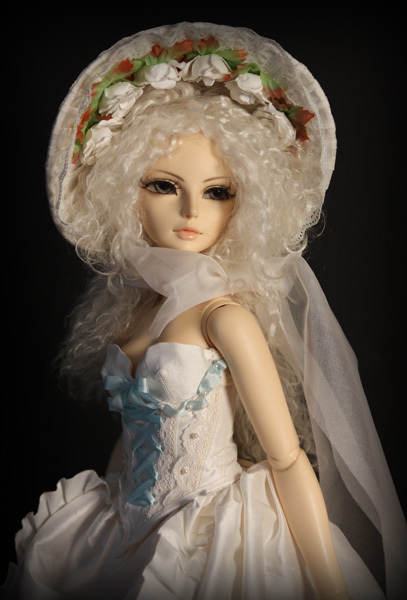 I love everything french, Marie Antoinette, 18th c inspired and historical fashion. Such a period of extravagance. The details that the gowns had, and to think that they were all made by hand! I have many books on the details of the fashion of the 1700’s, and it is truly breathtaking. One thing I do plan on doing this summer is to visit LACMA for the textile and fashion and FIDM’s fashion museum. I think this is why my favorite designers are Christian LaCroix and John Galliano. Both of these talented designers use the 18th c as inspiration in many of their designs. Especially LaCroix. He is just pure genius. 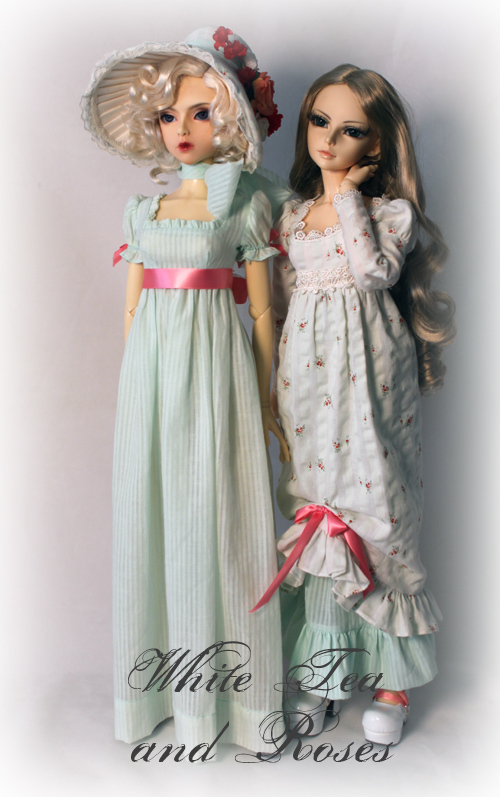 I have been having such fun doing these historical gowns for the Asian Ball Jointed dolls. I think they wear the fashions well and add a touch of whimsy to the style. I still have several fabric prints I plan on doing. Guess I better get a move on!